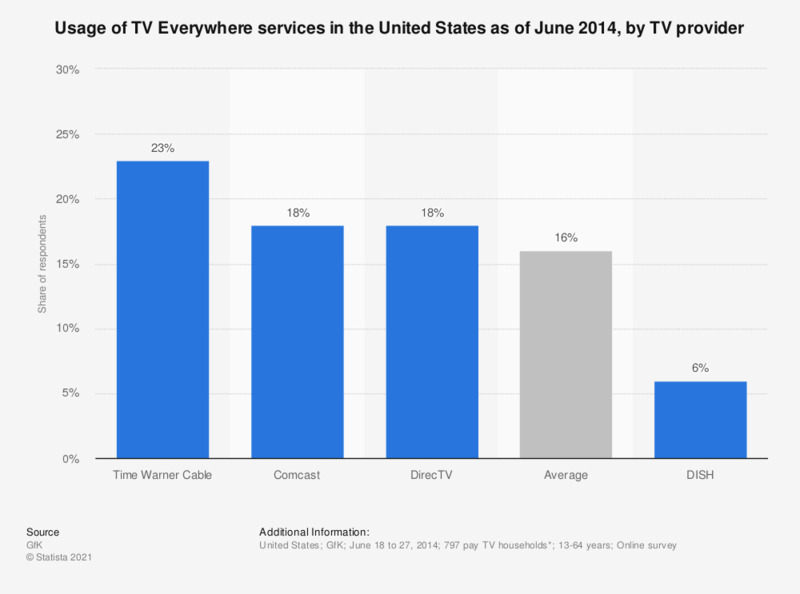 The graph presents data on the usage of TV Everywhere services in the United States as of June 2014, by TV provider. GfK found that 23 percent of respondents had used Time Warner Cable apps and/or services at least once to watch programs or movies. TV Everywhere is an authentication-based system that makes broadcast and cable programming available online through websites and apps; either live or on-demand. Released in 2009, majority of the American public is not familiar with TV Everywhere yet. In 2014, almost half of TV consumers had not heard of TV Everywhere. The service can be used on multiple devices, tablet being the most popular one among TV Everywhere users. As of the fourth quarter of 2013, over 40 percent of TV Everywhere content streams were accessed via tablets. The release of TV Everywhere could be seen as a response to recent trends such as cord-cutting. The share of cord-cutting U.S. households grew from about four percent in 2010 to over seven percent in 2014. According to a TDG survey, almost 15 percent of the respondents reported some level of likelihood to cancel their pay TV subscription in 2014. The fact that cable is too expensive and online paid services are cheaper than cable are among the most common reasons for cutting the cord in the U.S. The penetration of streaming services in the U.S. is another major trend in the broadcast media industry. In 2013, 38 percent of the U.S. population had a Netflix subscription. Between all Hulu services – Hulu, Basic Hulu and Hulu Plus – the company had 36 percent of the share. Netflix has over 43 million subscribers in the U.S. as of the third quarter of 2015. * Detailed household subscription info: Comcast: n=157, DirecTV: n=168, DISH: n=86, Time Warner Cable: n=98.